A little further on, I came to the "Goestgifvaregard" of the town. On one side of the gateway I observed a post, on which was painted in large letters, "To St. Petersburg, 1735 wersts." This was the first mark I saw of the change that Tornea had undergone by the fortune of war; its distance was now calculated from a new centre. As yet, little change has been made in the laws, as was agreed by the treaty of cession; but who can answer for its being observed when the performance of it depends solely on the will of one man, who has deprived his subjects of the power to resist his commands. Is there much reliance to be placed in a man who, in the plenitude of his power, lately issued an ukase, forbidding all persons under a certain age to wear spectacles? Already the Emperor has made an alteration in Finland; it is but trifling, some will call it nominal, but the people, who feel that it is the first step towards assimilating their country to the rest of the Russian empire, cannot look upon it but with distrust. While under the Swedish crown Finland was divided into Loens, over which officers, called Landshöfvdingar, or the heads of the land, presided; latterly the Autocrat had taken a dislike to that Swedish title, and substituted the more Russian one of Governor and Government. The next day the young Norwegian, whom I had left at Ranby, came to Happaranda, and we drove over together to Tornea. The peasant that went with us was a Finlander, and wore the handsome cap peculiar to that nation. It is a cloth or velvet skull-cap surrounded by fur, much after the manner of the tiara of the Russian women. They also wear a particular kind of boots, called komager, the feet of which are made of one entire piece, and the leg that reaches up to the knee of another. 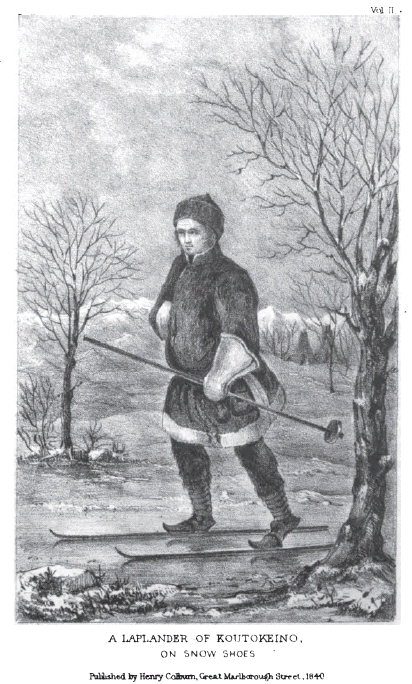 As the soles are not harder than what would be the upper leather with us, they are much better suited for walking on the snow and keeping the feet warm than the common sort of boots; the same kind are worn by the Habitants of Lower Canada.